T. Boone Pickens was the clear star of yesterday's morning session. The 80-year-old Texas oilman/billionaire-turned-wind power-advocate was funny, sharp, and clearly had the crowd's attention. 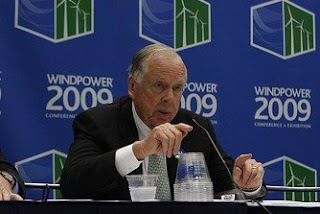 Pickens discussed his support of wind power, which is a pillar of his Pickens Plan. The Plan calls on the U.S. to generate at least 20% of its electricity from wind power, build a "21st century backbone electrical grid," provide incentives for homeowners and owners of commercial buildings to implement energy efficiency upgrades and use America's natural gas to replace imported oil as a transportation fuel (this is an apparent expansion of his original Plan launched last year, which only included the wind and natural gas pieces). "If they don't want it, don't build it. I'm interested in building wind where people want it...millions of jobs will be created with the wind corridor from Texas to Canada...and I’m convinced the Obama Administration wants all of this, and that’s good." When someone argues against the Pickens Plan, Pickens asks them what their plan is to get off foreign oil. If they don't have one, he explained, "then their plan is foreign oil. If a congressman runs [for office] and doesn’t have an energy plan, he should be labeled 'foreign oil.' I don’t care if they’re a Democrat or a Republican." Kurtis asked Pickens about some landowners' opposition to transmission lines, which are desperately needed to move the power from the windy plains to the city centers that need the power. As an owner of a huge amount of land himself, would Pickens oppose giant transmission lines crossing it? "My friend, Ted Turner, and I talked about this recently and I asked Ted that same question. He said, 'If it’s good for the country, then it’s good for Ted Turner.' I have the same answer. I have a feeling that we’re going to have a lot of landowners in the U.S. who say that too. This is for the security of the country." "We don’t need oil companies. Why do we need Shell and BP? I’m serious. This can all be done without them. Shell and BP are international oil companies and I don’t know what their agenda is, but I know my agenda and what the American people want and we’re in sync...This administration is clear they want an RES. Just give it a little bit of time...I’m very optimistic. We’ve cleared every other hurdle as we’ve gone down the track and this is all going to look very different six months from now." "The challenges wind companies talk about now are going to get cleared up this year. You’re going to know by the end of this year what you’ve got. By the end of the year, legislation will be passed that’s beyond any sort of energy legislation you’ve seen to get us off foreign oil. People want this energy issue fixed and I believe this Congress is going to make that happen." Wind turbines are great for alternative energy. People should compromise for the world. If you ask me, the constant sound of mosquito buzzing is not very pleasant. Wind turbines are not that loud. Good investment for future! This blog is really informative; I have gone through all the posts. I don't know why the blog master is not interested in posting some more relative information. I request the blog master to add some more content to this great blog. I shall link from my blogs to this blog soon. Best Hopes.com Offers free review service to hundreds of public utility products and service. This is for public use and people can often come to read reviews and very many products here- new products are being added to this site day by day. Whole services free for all. The list of our review on almost all products and services are including Internet Online jobs, Make money home, Web promotion, Child custody information, Saving marriages news, HIV, Cancer, Dating, Education and water fuel. You can download the information from the following URL http://www.besthopes.com that for free. I Hope that you will add more free information to the comment boxes to let people read about these other interesting subjects. Aneesh - I'm not sure what you're referring to, unless it's the fact that I delete obvious spammers from my post's comments. For example, your comment doesn't have anything to do with the post or my blog; it's an advertisement for your site. I'm not deleting it for now, in order to answer your question: No, I don't allow my comment boxes to be used for people to spam about unrelated topics. The newer models of vertical wind turbines keep getting smaller, sleeker, and more efficient with each new design. Besides the benefits previously mentioned, recent models currently boast of the following; a lower profile on rooftops, not subject to the same regulations as their horizontal counterparts, less noise, almost no vibration, lower maintenance and repair costs due to fewer moving parts, and self regulation spin speeds in high wind circumstances.